Khan’s visit began at Aspetar where he was given a comprehensive tour of the hospital’s world class facilities and the services it provides to the world’s elite athletes. Khan was received by Director General Dr. Mohamed Ghaith Al-Kuwari and a number of hospital officials who presented an overview of the history of Aspetar and the significant developments it has achieved in the fields of sports medicine and research. Khan also expressed an interest in collaborating with Aspetar in the future by conducting a training camp there to benefit from its advanced services, which would help him maximize his competitive potential in the face of the rapidly developing world of boxing. Khan then visited Aspire Academy where he met Director General Ivan Bravo and learned about the Academy’s philosophy and its important role in developing Qatar’s future generation of athletes, in addition to the various community and humanitarian programmes it offers. Khan was then given a tour of Aspire Dome, which he commended for its contribution to helping promote sports on a local and international level. At the end of his visit, Khan thanked Aspire Zone Foundation for organising the tour, adding that he was extremely impressed with the world-class facilities and services that Aspire Zone Foundation and its member organisations offer. He also praised their role in promoting a sports culture in Qatar and beyond, whether through Aspetar’s strides in sports medicine or Aspire Academy’s role in preparing the sports leaders of tomorrow. He concluded: “This is the first time I visit Doha, but it certainly will not be the last”. 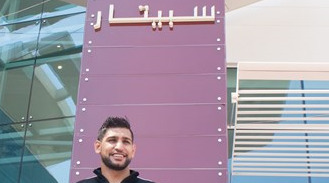 Two-time former world boxing champion and current WBC Silver Welterweight belt holder Amir Khan visited Aspire Zone this afternoon (14 October 2015), where he toured Aspire Academy and the world renowned orthopaedic and sports medicine hospital, Aspetar. British born Khan was accompanied by his father and Mr. Yousuf Ali Al Kazim, President of the Qatar Boxing Federation (QBF). Jan 28, 2017 AZF Unveils its Programme for the Sixth Annual National Sport Day Aspire Zone Foundation’s (AZF) National Sport Day (NSD) celebrations are rapidly taking shape as the NSD organising committee at AZF puts the final touches to this year’s programme of activities. The activities are being organised by AZF and its member organisations: Aspire Academy, Aspetar, and Aspire Logistics and will include more than 25 unique events for all members of the community to enjoy. Moreover, AZF will host more than 18 entities participating in NSD celebrations. As with previous years, 2017’s plans prove that AZF really does offer something for everyone, no matter their age or level of fitness. Feb 15, 2017 Qatar's Minister of Culture & Sports in AZF’s National Sport Day Activities Large crowds enjoyed a refreshing experience due to the cooler weather during National Sport Day celebrations in Aspire Zone this year. A number of prominent officials and dignitaries attended on the day to show their support for the development of sports and sporting activity in the country. These included the Minister of Culture and Sports, HE Salah bin Ghanem Al Ali, popular former Qatari athlete Captain Talal Mansour, and several of Qatar’s most promising young Olympians.